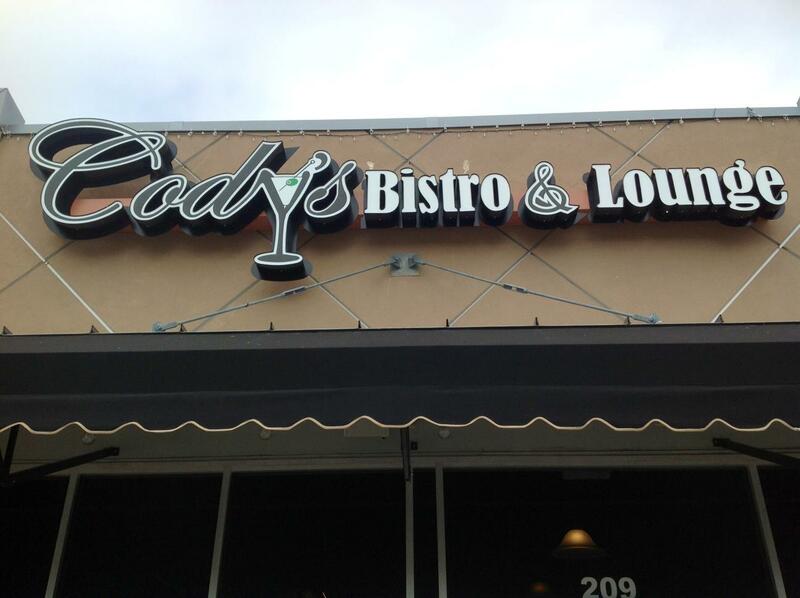 Cody’s Bistro and Lounge opened back in November, 2012 and has slowly been gaining the awareness of San Marcos residents and diners. San Marcos can always use more locally-owned and operated restaurants and especially restaurants that offer fresh and different choices to San Marcos Diners. 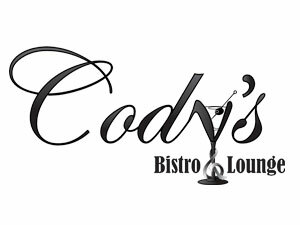 Cody’s Bistro and Lounge is among the newest additions to the San Marcos Restaurant Scene and is well on its way to becoming a San Marcos Staple. When I saw that they had taken this location, I was very excited to see what might turn up. 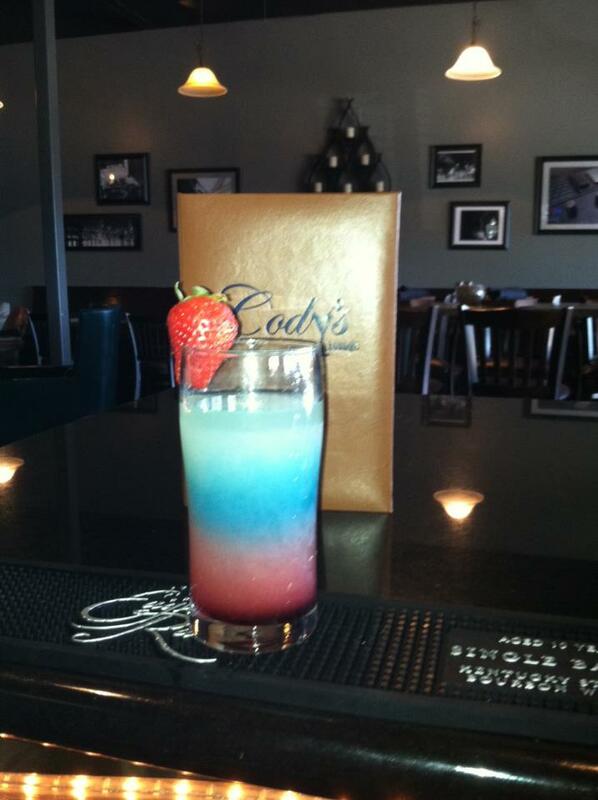 I have been to Cody’s on six separate occasions and each time I have been very satisfied and impressed with their food. As soon as I saw the kind of food they were offering, I had to try as many things as I could. The “Specials” are always original and interesting and the regular menu is very approachable and has something for pretty much everyone while offering some very unique flavor combinations. I have to say that I really enjoy Cody’s approach. Their menu and preparations are delicious and their service is fantastic with a very personable head Chef and staff and also a very speedy service even in the midst of larger crowds. 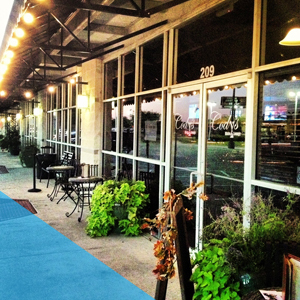 Cody’s Bistro and Lounge is located at 690 Centerpoint Road Suite 209. Their operating hours are Monday – Wednesday: 11:00 am – 11:00 pm and Thursday – Saturday: 11:00 am – 12:00 am and Closed on Sunday. Cody Couch, the Chef and Bartender is a really great guy and I have been fortunate to get a chance to talk to him a decent amount throughout my review process. He is clearly very passionate about making really original and flavorful food and drinks and I got a sense of someone who genuinely enjoys what they do. He is always talking about doing more and making things even better and trying new things and dishes. Cody is awesome. 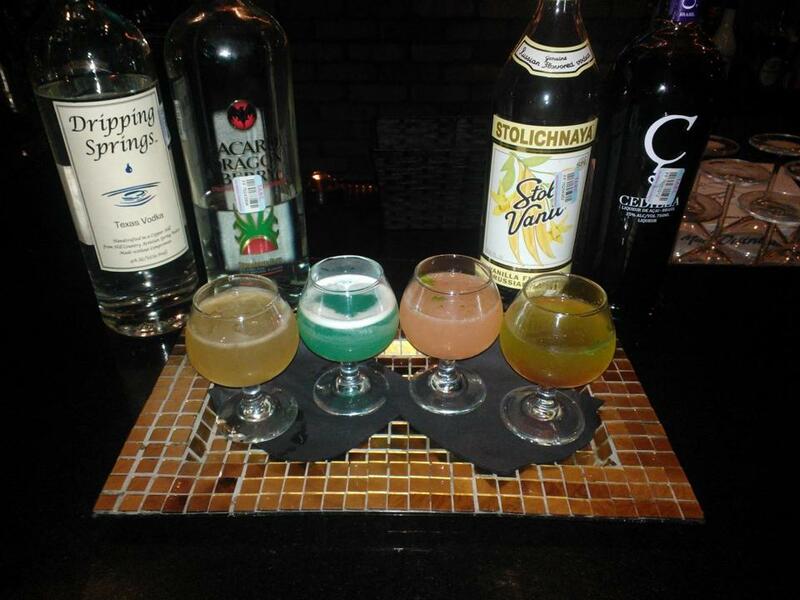 Not only is he serving up some fantastic savory dishes, he is also a very skilled Bartender and is offering some very cool original Drinks. 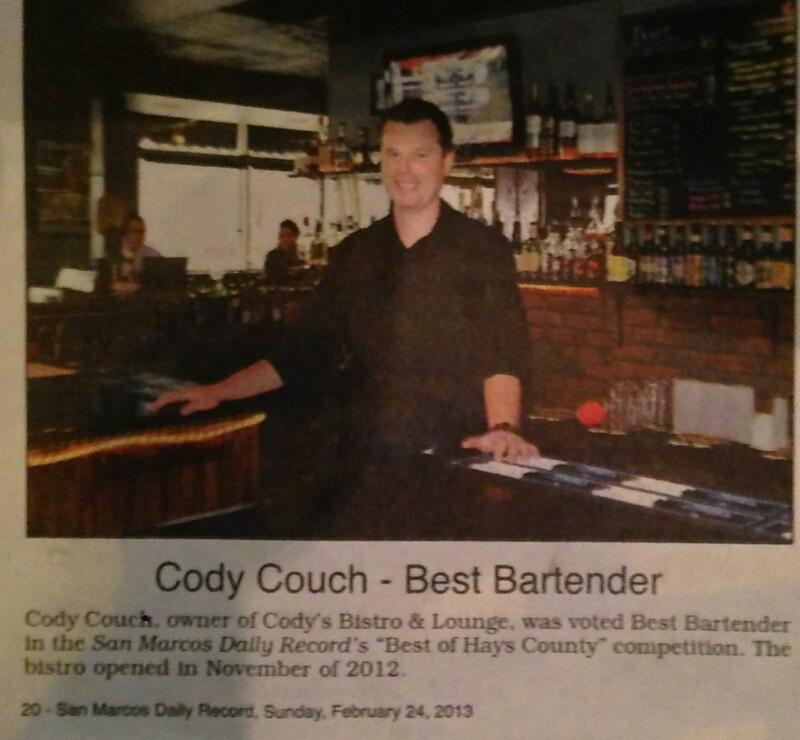 He even won the choice for “Best Bartender” in Hays County by the San Marcos Daily Record for 2012. 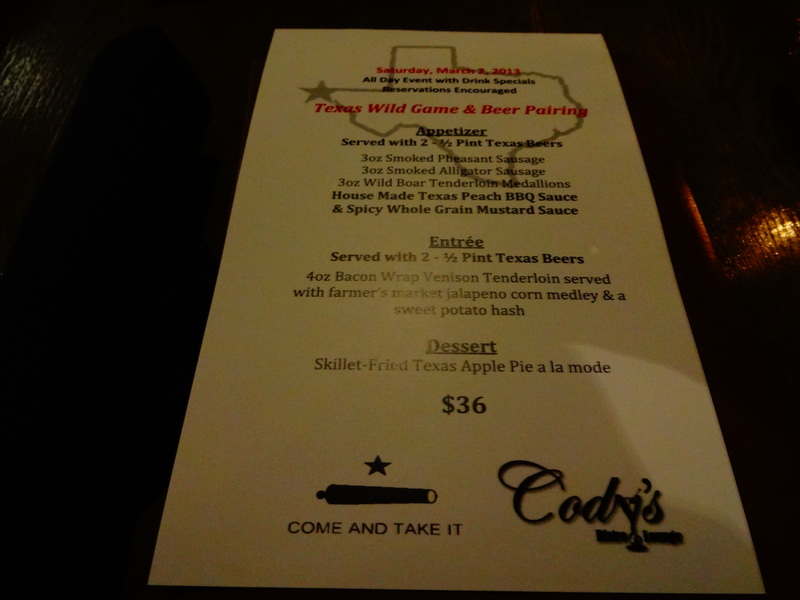 Cody’s is also putting on special food events with special menus. 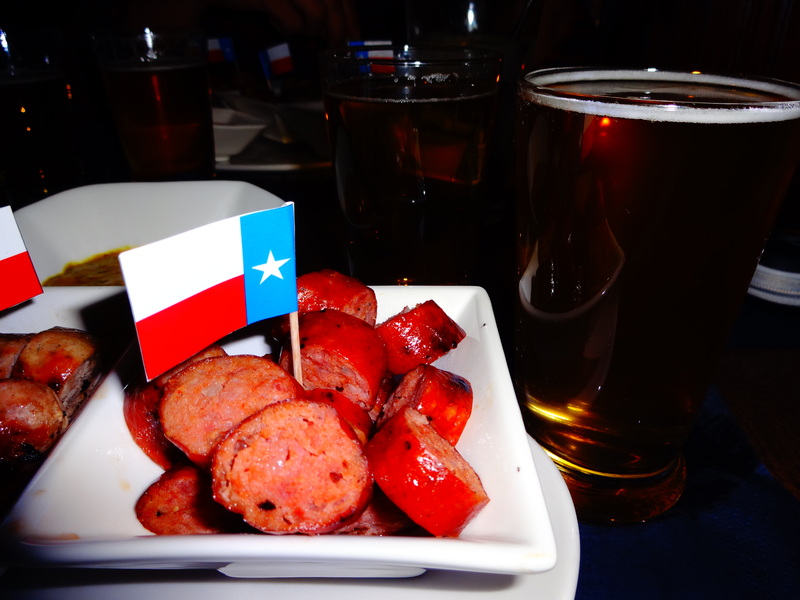 I recently went to their “Wild Game and Beer Pairing” Night in celebration of Texas Independence Day and I was so impressed at his menu and beer selections and just as much, the seamless execution of the chosen menu with such a large crowd. Cody informed me that he will be trying to put on events like this one quite frequently and I highly suggest attending one. 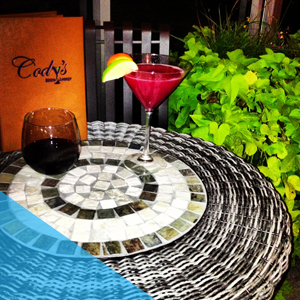 Cody’s Bistro delivers to diners a very relaxed atmosphere and I really think most anyone would enjoy this restaurant. They will host private events, just call them and I am sure they can figure something out. They have daily Lunch specials and “soups of the day” and can really get you a good, wholesome meal at most anytime of the day. They are also really great for grabbing a drink with some friends. 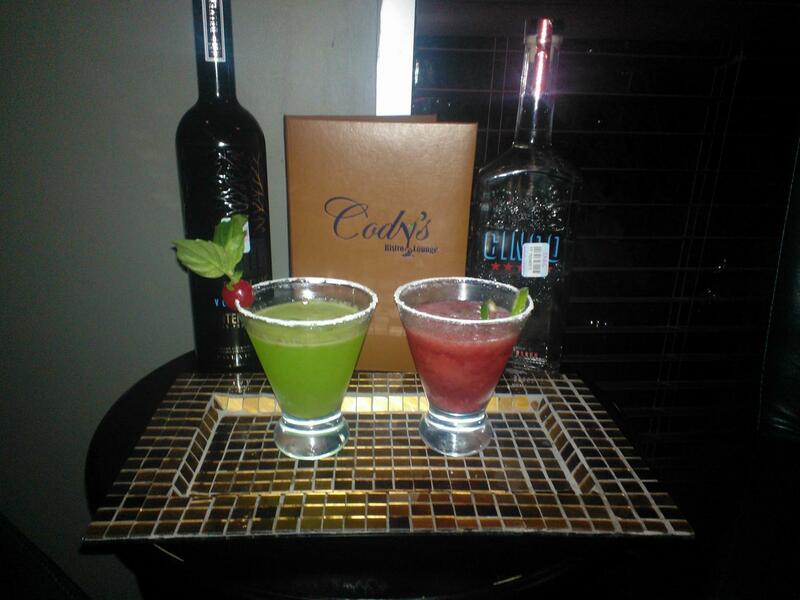 As mentioned, I have had the opportunity to try quite a few dishes from Cody’s Bistro and Lounge.. 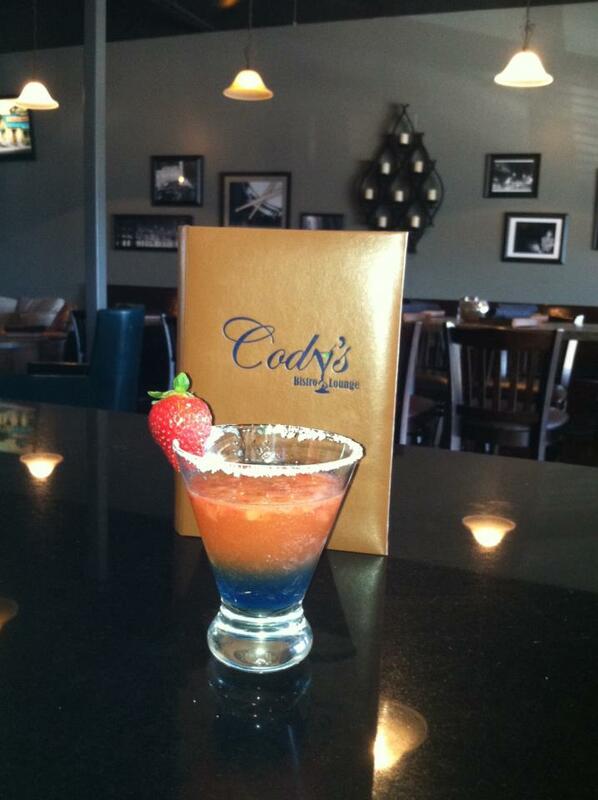 Here is a sample of what Cody’s is serving up every night. I will start with the Wild Game and Beer Pairing Night. This was so delicious and the Beer pairings were done with noticeable skill. Everything tasting amazing. 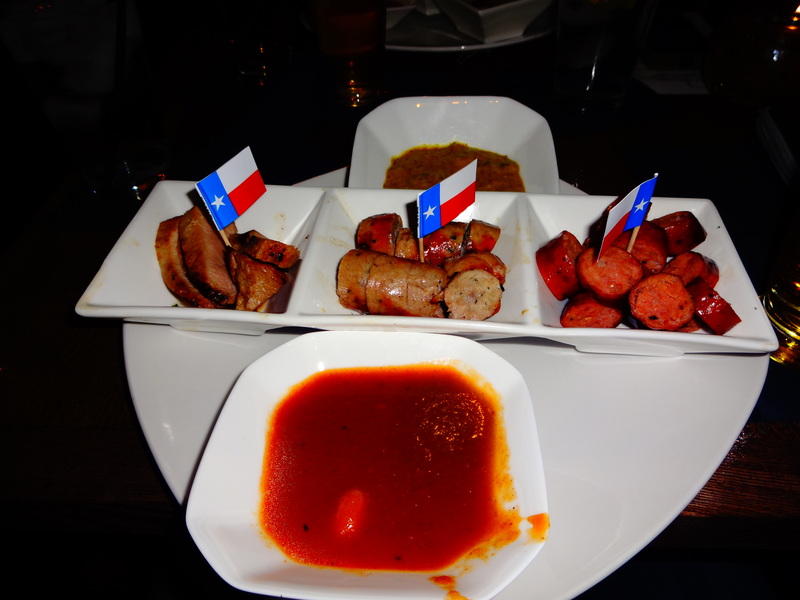 The First Course of the evening was a Trio of Wild Game featuring Wild Boar, Smoked Pheasant Sausage, and Smoked Alligator Sausage(From Left to Right) served with a House-made Texas Peach BBQ Sauce and a Spicy Whole-Grain Mustard Sauce. The Sauces were so fresh. The peach sauce was richly sweet and slightly spicy and tangy and the Mustard piquant and possessing a marked bite to it. 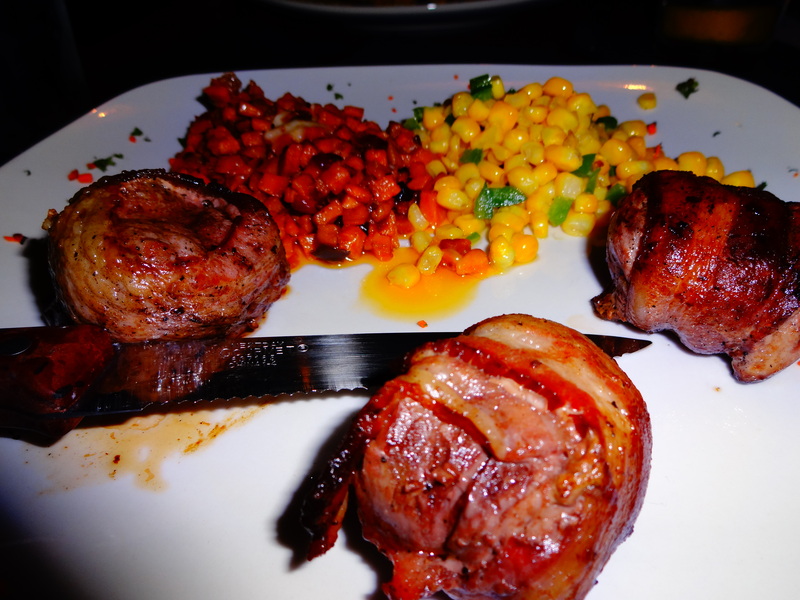 Each type of wild game was cooked so well and seasoned just great. I was very very impressed with each preparation. The Main Course was a 4 Oz. Bacon-wrapped Venison Tenderloin served with a Farmer’s Market Jalapeno Medley an a Sweet Potato Hash. This dish was just as good as it looks.. Very simple yet bold flavors and a very clean presentation and focus. Each item paired so well with one another. Now onto the regular menu items. 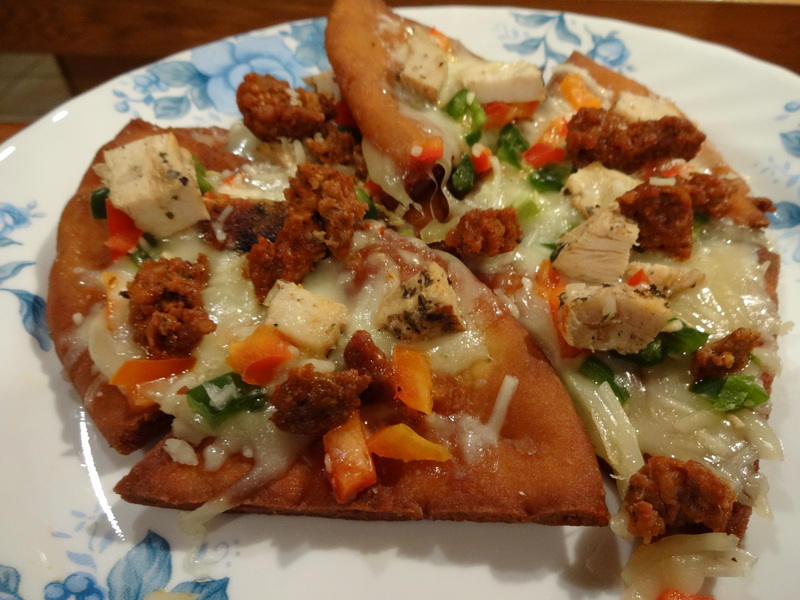 These consist of Flatbread chips topped with Asiago and Mozzarella Cheese and also with Cilantro, Jalapenos, Green Onions, Fresh Chorizo, and Grilled Chicken.. This dish is a very nice starter.. I really liked all of the flavors at play in this dish and also how fresh everything was. A real interesting play on Nachos. It was slightly spicy, salty, and the texture from the bread as perfectly balanced between crispy outside and hot, moist inside. Here are some of their Naan Bread Pizzas.. 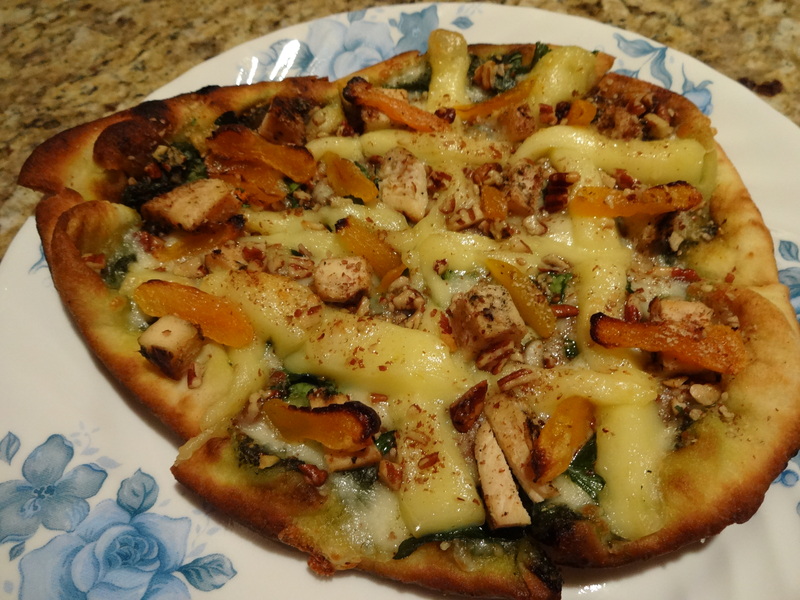 This one consists of House-made Pesto, Brie Cheese, Pecans, Apricots, Spinach, and Grilled Chicken Breast.. I have never had an assortment of toppings quite like this but I honestly thought it worked very well. The richness of the Brie was very balanced by the sweetness of the apricots pairing with the necessary bitter from the spinach and pesto.. and as I have said before, Naan Bread can be a perfect pizza bread.. 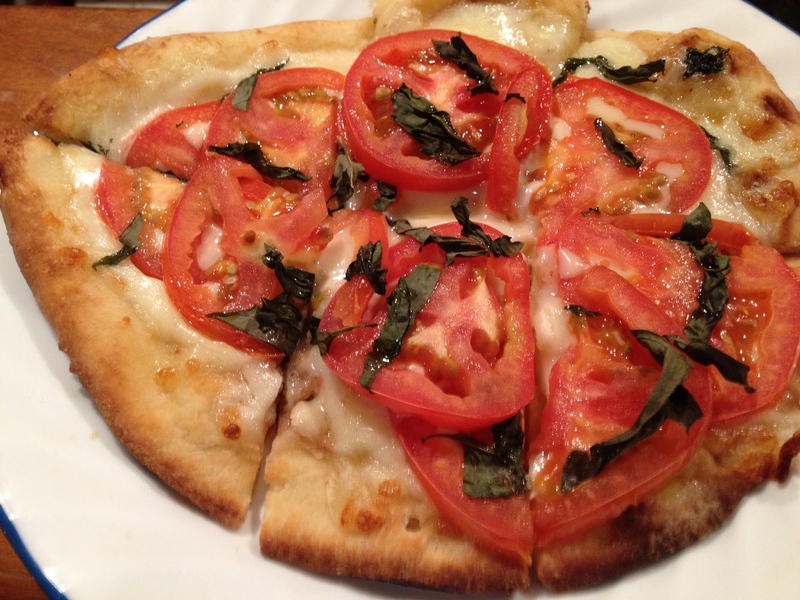 I really thought it was great and after all the crust is very crucial with respect to pizza quality and taste. I really liked the idea of using Indian Naan Bread as the crust for Pizza.. This classic was done just right and the ingredients sang with flavor. The crust had the perfect crunch to it and the cheese was definitely chosen well. I would eat this all the time. 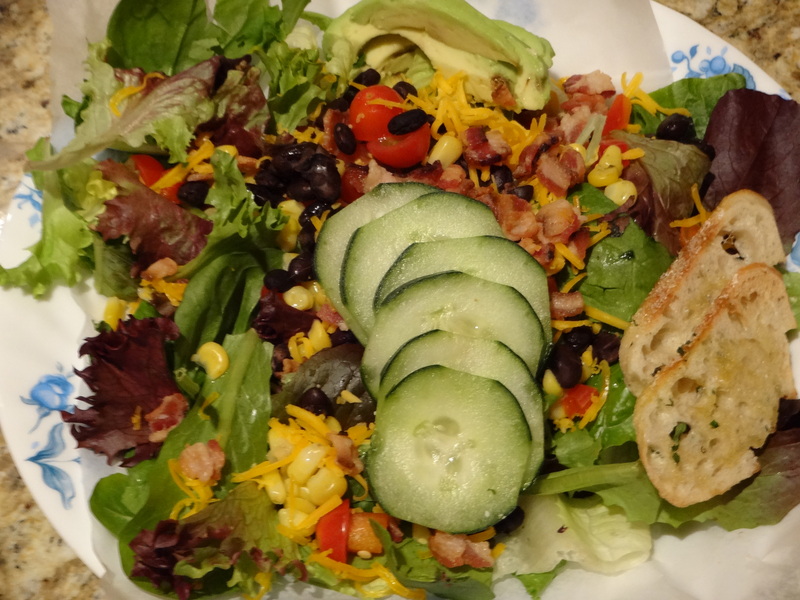 This consists of Romaine and Fresh Greens, Corn, Black Beans, Cucumbers, Cherry Tomatoes, Bacon, Avocado, Red Bell Peppers, Shredded Aged Cheddar Cheese, served with a blue cheese vinaigrette… Salads are often an afterthought at restaurants. Most salads that are offered are usually either not made with fresh ingredients or are just bland and flavorless. This salad was very well thought out. It is very delicious. It is noticeably fresh and also has all of the necessary flavors and ingredients to make it filling but not too filling, as a salad should be. 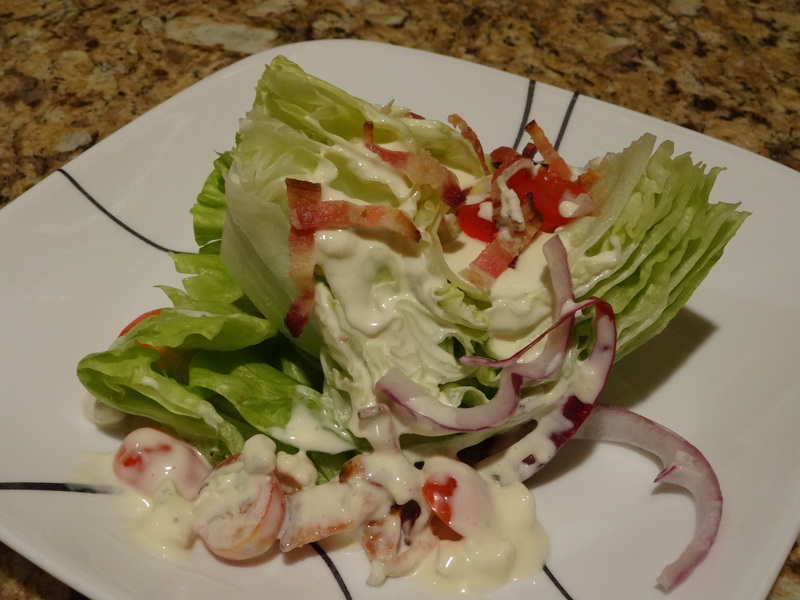 This was a beautifully-executed presentation of a classic wedge salad and was honestly just as much a treat to take pictures of as it was to eat. that is the most photogenic salad I have ever seen. It was also incredibly satisfying and tasty. This Soup was so warm and rich had just the right amount of salt and savory flavor. 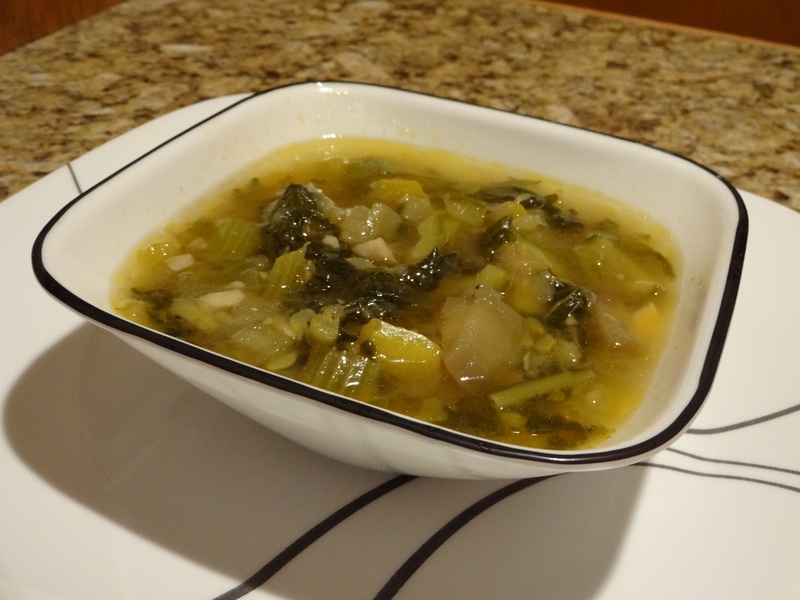 It was very wholesome and filling and one of the best Vegetable Soups I have ever had. This dish was the perfect balance of creamy and savory and was made using obviously fresh and high quality ingredients. 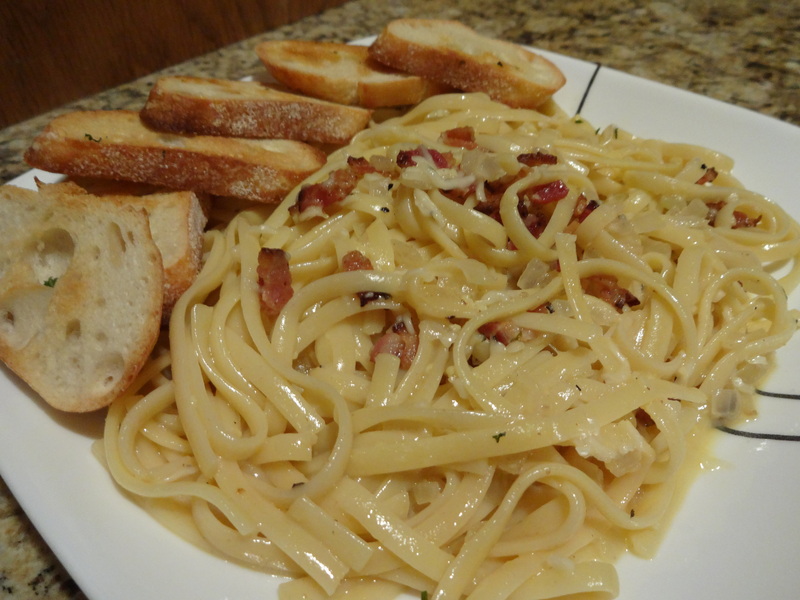 The Bacon was cooked so well and the sauce was so balanced between creamy, savory, and salty. I really am excited to see what Cody cooks up next and what kind of special food events he is planning. This restaurant is definitely a place to watch and if you have not had a chance to eat here, I very enthusiastically recommend that you give them a try. I always look for restaurants that try harder and are more creative with their food and presentation and I am so glad to have found this restaurant.